After making the Maacchi Pulao, I had actually picked out a list of things to be tried for Parsi Cuisine, hosted by dear Meera of Enjoy Indian Food, for 'RCI-Parsi Cuisine'. However, it shows clearly I wasn't able to do any of it. I just got to one dish and sharing it here, which is also late, but thanks Meera for accepting it. I had frozen Salmon fillets and so decided to make another fish item again. The pictures of the Patio/Patia looked really mouthwatering everywhere that I looked. So, decided to go with it and this is the source of the original recipe. The dish is called Fish Paatio and I must say, tastes very good and doesn't take much time to make. I am writing down the quantities that I used and the method for future reference. - Grind the red chillies, garlic, cumin, and turmeric together into a paste (or see the note below). - Rub the fish with the chilly powder, turmeric and little salt. - Heat 1 tbsp of the oil in a heavy pan over medium-high heat. Add the green chillies, allow to sizzle for a moment, and follow with the onions. Saute, stirring occasionally, until the onions are golden. 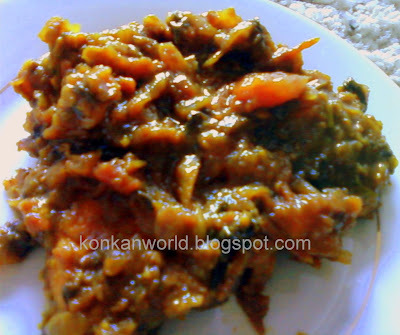 - Add the masala paste and stir over moderate heat until the aroma rises. Add the tomatoes and the fresh coriander. Cook over low heat till its pulpy. - Add salt to taste, the jaggery, and tamarind/lime juice to get a good sweet-sour balance, adjusting all as needed. - Fry the fish separately on a tawa in as little oil as possible until tender. Add to the onion and tomato mixture. Cook together just enough to heat through and they all come together. - If you haven’t got a grinder, you can still make patia masala in a food processor or blender. Pound the cumin seeds first in a sturdy mortar or pulverize them in a spice grinder, then add them to the food processor bowl along with the garlic, chopped first to make grinding easier, 1 to 2 teaspoons cayenne pepper, and the turmeric. Dribble in just enough water to turn the mixture into a paste. - I used Salmon fillets and cut them into slightly bigger chunks. So, off this goes to 'RCI-Parsi Cuisine', hosted by Meera of EnjoyIndianFood. Regional Cuisine of India- RCI is the brainchild of Lakshmi of Veggie Cuisine. P.S: Please excuse my photograph, I took this from the cell phone as my camera is broken.